ABOVE Containers in transit at the Port of Mobile. Nil, or close to it. Those were the chances the Mobile area had for landing Walmart’s new mega distribution center without the intermodal transportation facilities at APM Terminals Mobile at the Port of Mobile. APM Terminals Mobile, a business unit of Denmark-based A.P. Moller-Maersk Group, has the infrastructure to unload numerous intermodal containers from ships and place them directly onto trucks taking the merchandise to Walmart’s vast facility in nearby Theodore. That capability was a major reason why Walmart’s facility — and more than 500 jobs that go with it — landed near Mobile. Intermodal typically refers to transporting cargo among different modes — ship-to-rail or ship-to-truck or air-to-truck, for example. Alabama has three major intermodal transportation facilities, and they touch a healthy chunk of more than $45 billion the feds calculate that Alabama does annually in exports ($21.7 billion) and imports ($23.6 billion). In addition to APM Terminals Mobile, a massive Norfolk Southern intermodal facility in McCalla, near Birmingham, focuses on rail cargo. Huntsville’s International Intermodal Center, adjacent to the city’s airport, is the largest air cargo facility in the state and among the nation’s largest for international air cargo. 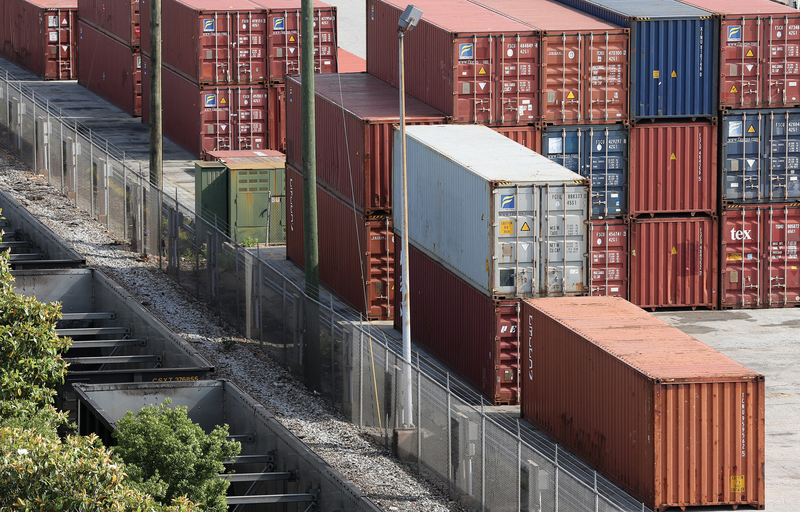 Services provided at the state’s intermodal facilities aren’t new, but they are increasingly important and in greater demand. 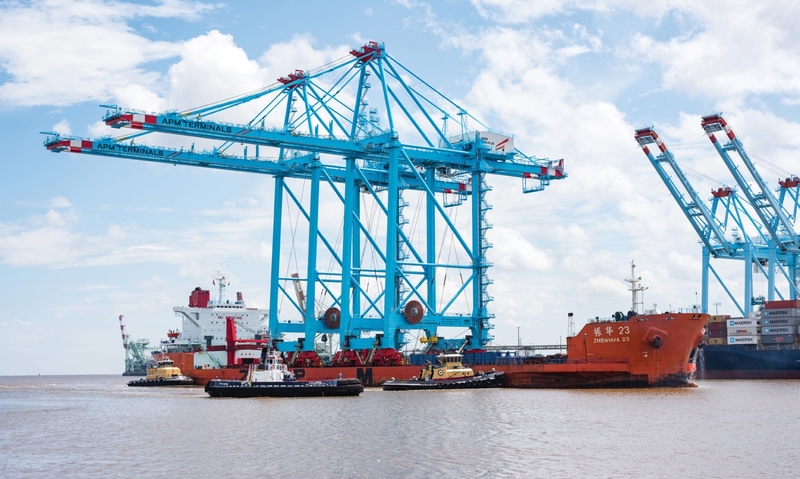 ABOVE Two new ZPMC Super Post-Panamax ship-to-shore cranes arrived at the Port of Mobile in summer of 2017, further boosting the port’s intermodal capabilities. APM Terminals Mobile is the largest of Alabama’s intermodal facilities in terms of investment, backed by about $550 million since it opened in 2008. The facility has an annual throughput capacity of 500, 000 twenty-foot equivalent units, or TEUs, a standard shipping volume unit that refers to a 20-foot intermodal container. The marine terminal at APM Terminals Mobile is currently undergoing a $50 million expansion that will bring annual throughput to 650, 000 TEUs when completed in late 2019, says Judith Adams, vice president of marketing at the Alabama State Port Authority. Complementing the shipping function, APM Terminals Mobile includes a container rail terminal that provides import, export and domestic rail service via Canadian National Railway along a route that includes Jackson, Mississippi; Memphis, Tennessee; Decatur and Chicago, Illinois, and Canadian markets. The rail terminal is accessible to the remaining four Class I railroads — CSX, Norfolk Southern, Kansas City Southern and BNSF — at the Port of Mobile. Export and import traffic is roughly 50-50 in Mobile, with slightly more imports. Overall, volume increased 20 percent last year at APM Terminals Mobile, and that can be attributed to several factors, according to Adams. For starters, the economy and trade are doing better, so normal market increases have occurred. Also, more container carrier services have been added, and agreements between carriers to carry each other’s cargo when feasible have increased volume. And ships are getting larger, which has increased capacity and potential for business. APM Terminals Mobile is Post-Panamax ready, able to handle the larger 8, 000-TEU ships built to navigate a wider Panama Canal. The terminal has a 45-foot draft with two Post-Panamax and two super Post-Panamax ship-to-shore cranes. The “super” cranes are the largest in the world. The Port of Mobile is currently the nation’s 10th largest seaport in the United States by volume. Its largest industries served include Alabama automotive, agribusiness, metals and retail/distribution. Volume is expected to increase by at least 10 percent in the wake of Walmart’s new distribution center, port officials have said. In North Central Alabama, Norfolk Southern’s $97.5 million Birmingham Regional Intermodal Facility is a major part of the company’s Crescent Corridor, a $2.5 billion investment aimed at developing a high-capacity intermodal freight route between the Gulf Coast and the Northeast. In operation since 2012, the Birmingham facility sits on 316 acres and includes more than 13 miles of tracks. Norfolk Southern foresees its Crescent Corridor eventually generating enough new business to take more than 1.3 million trucks off the nation’s highways after its completion in 2020. “Intermodal business has been the fastest growing sector of the rail industry for a number of years, and that trend does not show signs of slowing, ” according to Norfolk Southern spokeswoman Susan Terpay. “This includes both the domestic (freight moving within North America) and the international (containerized freight delivered to ports by ship) segments of the market. ABOVE Panalpina keeps commerce aloft at Huntsville’s International Intermodal Center. In Huntsville, volume is on the rise at the International Intermodal Center (IIC), which is part of the Port of Huntsville, along with Huntsville International Airport and Jetplex Industrial Park. Huntsville ranks 17th nationally in international air cargo tonnage, says Jim Hutcheson, business development manager at the Port of Huntsville. Air cargo tonnage, virtually all of it international, was 205 million tons last year, up from 180 million tons in 2015. That volume is divided roughly 50-50 between imports and exports, with slightly more in imports, Hutcheson says. Most of Huntsville’s air cargo is automotive parts, pharmaceuticals, electronics and fashion or apparel items. 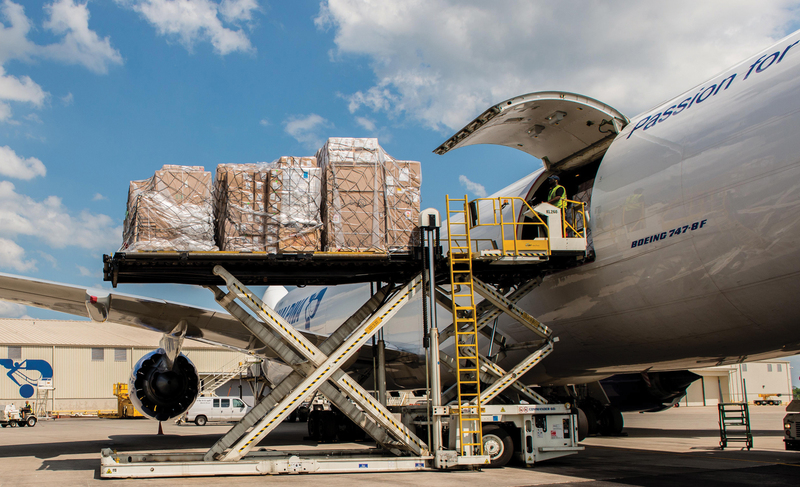 More than $170 million has been spent since 1992 on airport improvements in Huntsville, much of which has gone to enhance air cargo, which is essentially driven by Panalpina, a Swiss company specializing in air and ocean shipments. Hutcheson notes that Huntsville’s IIC is about more than air cargo. It also has Norfolk Southern intermodal container rail service, and that business has seen a definite uptick, too. The auto industry had a lot to do with that. The Huntsville IIC has direct intermodal rail service between the ports of Charleston, South Carolina, and Savannah, Georgia, with connecting intermodal service, via Memphis, between West Coast ports of Los Angeles and Long Beach in California and Seattle and Tacoma in Washington. Huntsville does not have an intermodal rail connection with Mobile. Container traffic through Huntsville’s IIC is divided roughly half and half between businesses in Alabama and Tennessee, with slightly more in Alabama. A higher percentage of the air cargo involves businesses in other states within a 600-mile radius, Hutcheson says. Having intermodal transportation capabilities isn’t always mandatory in industrial recruiting, Hutcheson says, but then again, there are times when it’s a must. Charlie Ingram is a freelance writer for Business Alabama. He lives in Birmingham.